I was so excited to see this challenge today! I so love working with color combos that someone else chooses for me! :) So for PTI's Day 5 Anniversary Challenge I chose Betsy' combo! Gorgeous colors to go along where her amazing style! My card is definitely Betsy inspired today! There I go with that Sheet Music IP again! I know I use this or the stamp set way too much but I can't help it! I just used Burnt Umber Palette and rubbed it all over the IP! Then I ran the Harvest Gold through! The distressing on the Edges is Tim Holtz Frayed Burlap! Love that stuff! You can click HERE to go to Nichole's blog to see all the other creations! so much inspiration in ONE place! Oh dearie, this card is so beautiful! I need to pick up that tag die...love the way it looks! 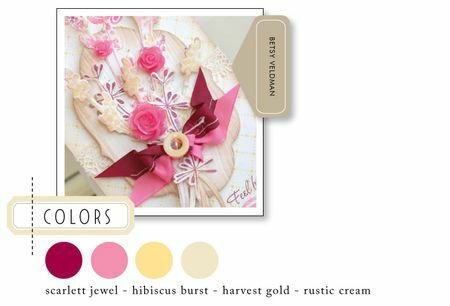 Great job with these colors- they are truly divine! Laurie- Your card is beautiful! I love how you used the tag in your card. Awesome job! 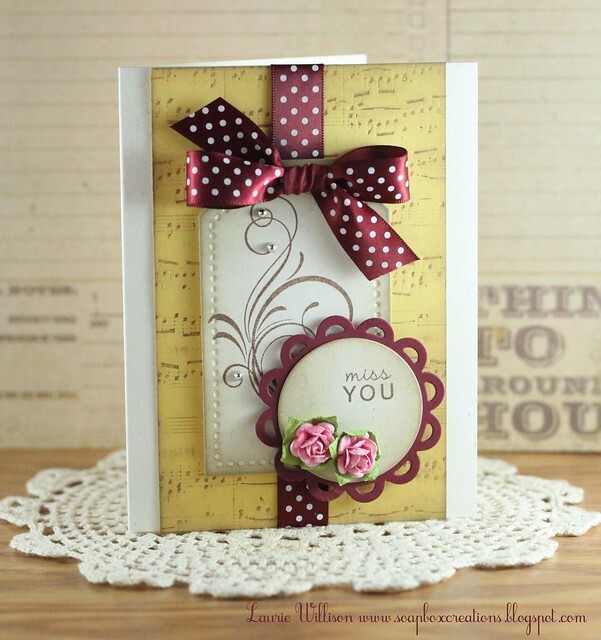 There is SO MUCH to love about this card, Laurie!! The bow is PERFECT and I just love the colors!!! Stunning! The inked up IP on Harvest Gold looks amazing. Love everything about this. What a beauty, Laurie! Love the letterpress look of the IP and that dotty ribbon. Good grief, this is a major beauty! I want some of that Scarlet Jewel ribbon! OH MY STARS Laurie! You ROCK! This is just gorgeous, I love it. Love that letterpress look and the tag and the limitless layer die! Sheesh, love it ALL! WOW, this is really STUNNING!!! This is really lovely. Love the look of the Sheet music IP. Oh your card is beautiful! I really like how you used Betsy's color combo. I don't think I've ever used one little scrap of Scarlet Jewel and never would have come up with that beautiful scheme. The sheet music IP is working for you, so don't fight the muse. Ok, now that I've inked up my BB:music and I love it, now I need to try this with the IP! The music notes look so aged and vintagy on the HG color! Beautiful Laurie! Absolutely stunning- I love the inking on the impression plate, and I absolutely adore the flourish on the tag (can't go wrong with those gorgeous pearls, either)! Very pretty card...love the swirl and the flowers and the tag...the colors are awesome! This is so elegant looking. I like the layout and may just draw that one for use another time. Just beautiful! Soooooo very beautiful!!!! Thanks for always inspiring!!! Hmmmmm. You have created som masterpieces with that music sheet IP. Must add it to my cart with my next order! I have tried my best to stay away from that tag but now I will just go ahead and jump off the bridge ..... is the water warm when I get there?? Looks freaking fantastic and I love the burlap ......maybe even better then the tea dye ........ do you sponge that on cuz I cannot swipe the TH distress on without making a huge mess.... I have to look into the explorer thing .... I use a mac and do not have explorer on here so I will check it out asap!!! Such a gorgeous card! I love how you tied the tie and tag together. WOW! So very elegant, I really love how you worked this color combo! This is just stunning - love the tag and the music bg is great. May have to check into this one. This card took my breath away! It's beautiful! Wow!! This is beautiful!! 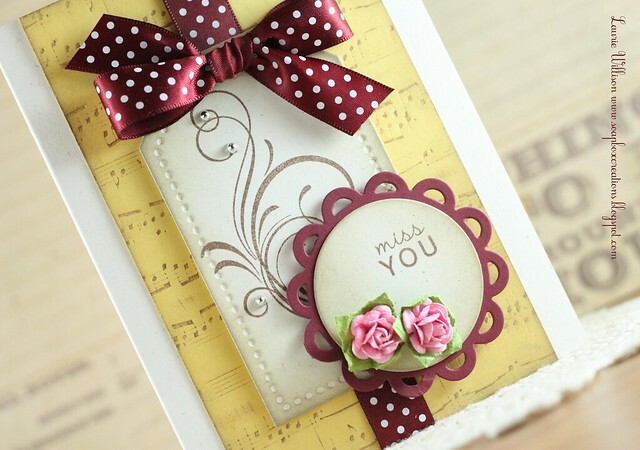 Love the letterpressed background and the way you used these colors! I also really like the design and layout of this card! Gorgeous! Laurie, this is stunning! Not what I'm used to seeing from you, but it just goes to show what a great stamper you are as you're able to switch styles effortlessly.